Whoever said the sedan is dead hasn’t been paying attention. Four-door sedans are rising like a phoenix and look better than ever. The 2019 Kia Optima and Toyota Camry both underwent overhauls that changed their looks in the past couple of years. Today, both have fierce faces with creases and angles that look sporty and sleek. Side by side, we couldn’t decide between them. So in this comparison guide, we’ll scratch the surface to get a look at what’s harder to see. It’s too early to get reliability scores for the new model year, but we can tell you which will foot the repair bill for a longer time should your car break down. 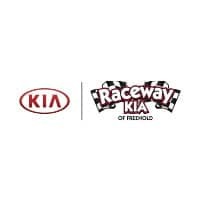 Simply put, Kia guarantees your Optima for a longer time than Toyota guarantees its Camry. The Kia warranty is good for five-years or 60,000-mile limited and 10-year or 100,000-mile powertrain. Meanwhile Toyota offers a three-year/36,000-mile basic warranty and a five-year/60,000-mile powertrain warranty on its Camry. We don’t need to tell you which is better. Looks are nice, but if you’re like us, we need an interior to match the exterior. 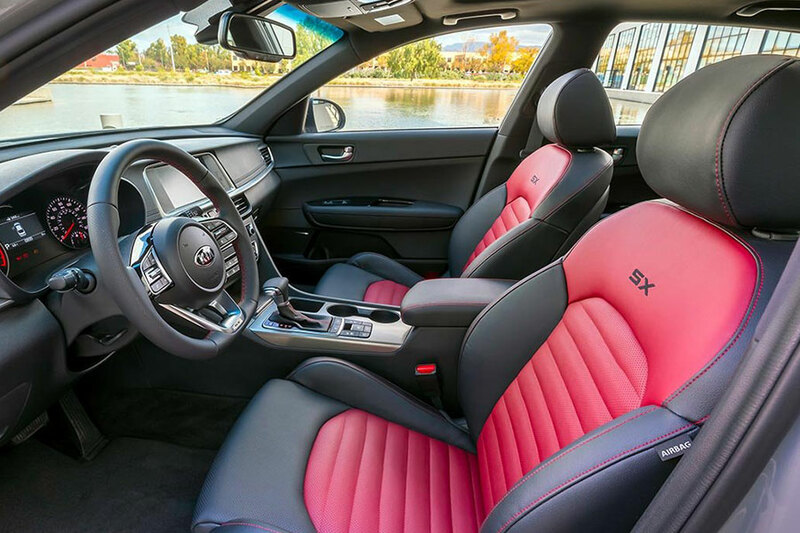 First of all, we love the interior of the Kia Optima. The Optima’s high-end materials have a luxurious look even while the Optima stays affordable. This Kia seats five on stain-resistant cloth, leatherette, or leather upholstery. You’ll find plenty of plastics in the Optima, but they are soft-touch, finely-grained plastics that take nothing away from the look of the cabin. There’s plenty of passenger space, with 45.5 inches of leg room up front. The trunk is also larger than average, totaling 15.9 cubic feet. Everything is smaller in the Toyota Camry. Front-row leg room measures only 42.2 inches and the trunk is on the small side for this class, enclosing only 14.1 cubic feet of cargo space. Besides that, we found the interior attractive with plenty of high-end materials. We did, however, notice more than a little cabin noise. 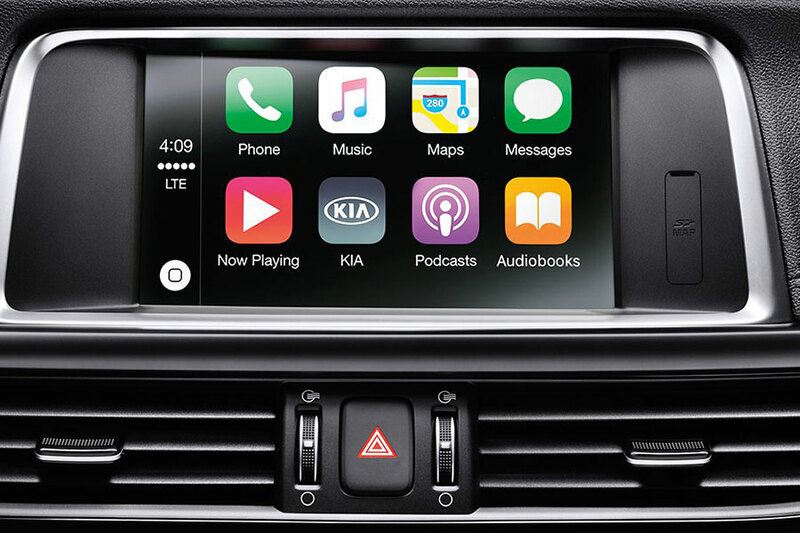 Every 2019 Kia Optima comes standard with Apple CarPlay, Android Auto, Bluetooth, USB port, six-speaker audio system, and UVO infotainment system with 8-inch touch screen. And it just gets better from there. There’s also standard safety features that include rearview camera, blind spot monitoring, rear cross traffic alert, rear parking sensors, forward collision avoidance assist, lane departure warning, lane change assist, lane keep assist, and driver drowsiness monitoring. Kia has made a name for themselves in affordable tech, and it shows. The UVO system is intuitive, well laid out, and responsive. The 2019 Toyota Camry comes with Entune, an equally easy-to-use infotainment system. Standard tech on the Camry includes 7-inch touch screen, six-speaker audio system, USB port, Bluetooth, Wi-Fi hot spot, Siri Eyes Free, and Apple CarPlay. Standard active safety features include rearview camera, adaptive cruise control, forward collision warning, pedestrian detection, lane departure warning, lane keep assist, and automatic high beams. That’s slightly fewer safety features but close enough to call this category a tie. Even with equally attractive styling and a tie in technological offerings, the Kia Optima has a better, more spacious interior and a longer basic and powertrain warranty. It’s a clear win for the Optima in this comparison guide.